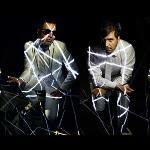 MTV IGGY: "For Fans Of: Bomba Estéreo, Nortec Collective and ZZK Records." PALENKE SOULTRIBE is known for their live performances, combining infectious Afro-Colombian rhythms with electronic production and live (GoPro) visuals. Their sound draws on deeply rooted tradition and melodies, while infusing beats and samples reflecting the vibrant Pan-Latino vibe of today. Originally formed in Colombia, the flavor of cumbia and Baranquilla's carnival will entice your palates. Their current home of Los Angeles is however responsible for that shimmering punchy-ness of PST's dance music. 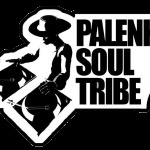 Palenke Soultribe was formed by producers Juan Diego Borda (bass) and Andres "Popa" Erazo (keys, samples & visuals). Teaming up with explosive drummer Argel Cota and master percussionist of all things Latin: Clodomiro Montes, was vital to unlocking their distinct sound. It all boils down to their highly energetic live shows, for which they've been hailed from the Swiss mountains, to Mexico City's urban jungle and sweaty clubs in New York. They continuously push the envelope by adding surprising visuals, integrated GoPro camera's and looping samples they've gathered. In 2016 they'll continue their long standing collaborations with Palenque Records, the legendary band Son Palenque and singer Petrona Martinez. "The Colombia natives meld dancehall, cumbia and EDM into a party-starting punch. Mar, Palenke's new album, is a better Major Lazer record than the new Major Lazer record. Eat your corazón out, Diplo." Glastonbury '15, Paleo Festival Nyon CH, Chicago World Music Festival, Winnipeg Folk Festival CA, SXSW, Fusion DE, Grand Performances LA, Colors of Ostrava Cz, Me:youzik Festival LUX, Sfinks Mixed BE, Festival Mundial NL, PARADISO Amsterdam NL, Sodra Teatern Stockholm, Club Global CPH, Esperanzah BE, Couleur cafe BE, and shows in NYC, Tropicalia DC, Mexico City, Bogota CO and much more!